If you have a toddler like I do, quiet footprints generally mean they are doing something wrong. But in this fun and easy craft, they are doing something right and getting messy WITH you! I am a firm believer in messy play when supervised and today P and I decided to take some time and kick off Halloween crafting with an easy to create Halloween Ghost Footprint. Please note we had been playing outside in the red dirt for an hour so Ps legs and feet (and hands and hair and every other part) have a red tint because of that. 1) Personally, I chose to strip P down to his diaper for this one and take it outside. 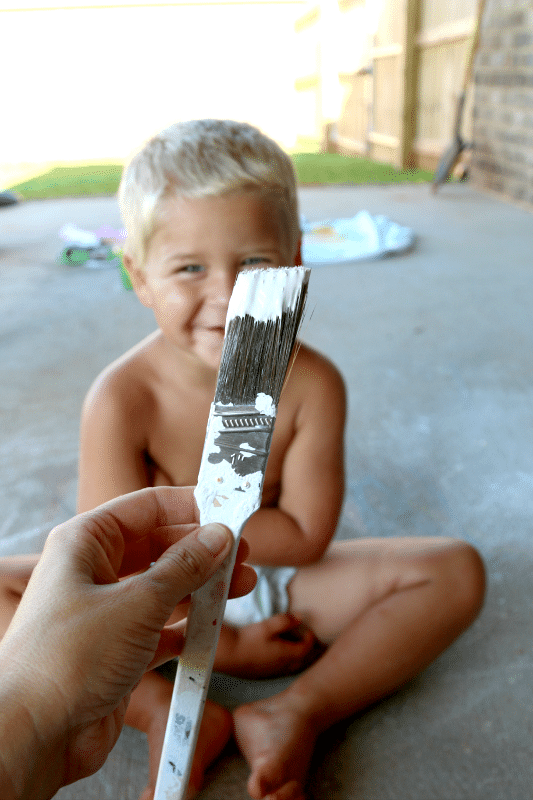 I have found even our “washable” paint tends to mess up his clothing and since it’s still beautiful weather, we just got comfortable on the back porch. 2) Paint those feet! Now you may want to skip the toes. We learned that after painting them- we were trying to make a ghost, not an Octopus, but feel free to experiment! Then I pressed his little feet on the paper and voila! Of course, it was so much fun that we had to do it on a lot of papers and he wanted to do mine too. Then we decorated our ghosts with some googly eyes and some spooky letters for a fun, easy, every day kids craft. Since we had the paint out now we had to get seriously messy. We painted our hands and our feet and even took the paint to the toy trucks (and then put them through the car wash of course!). Stay tuned for more HALLOWEEN Crafting fun the rest of the month and all of October! Super cute! I’m totally sharing this on our Twitter! Love it!